Velvet Tango Room is in a nondescript hole-in-the wall located on the fringes of the Ohio City and Tremont neighborhoods of Cleveland. From the outside the facade of the Velvet Tango Room blends right into the dilapidated buildings that surround the venue. On Friday night, the street was quiet, the glow of downtown was behind us, but Columbus street was dark. Had we not been to the Velvet Tango Room before, the glow of the neon sign would have been the only thing to lead us to our destination. The Velvet Tango Room is not like other bars, there are numerous articles touting how exclusive and elusive entrance to the Velvet Tango Room can be. You see, there is no need to make reservations to sit in the front room; although the venue is a secret in and of itself, the secret backroom, which is accessible by key card entrance only, requires reservations in advance...sometimes weeks in advance. Some people have written that the backroom is for the socially elite -- despite the fact that we're attorneys, that's hardly the case. 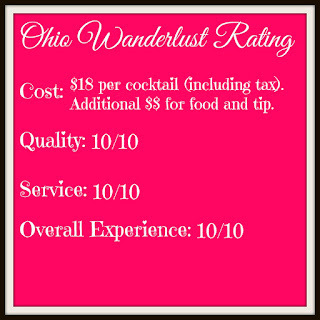 Just make a reservation and follow the rules to enjoy this swank location. The speakeasy style of the Velvet Tango Room has one more unique feature -- a dress code. Follow the rule that "you can never be overdressed" and you'll do just fine at the Velvet Tango Room. Some articles suggest that dress code violations will get you turned away if they are not easily remedied. This is a throw-back to another era, a time when appearances were everything, so get dressed up to the nines before venturing out -- The Velvet Tango Room is locally and nationally acclaimed for a reason. This is not just a bar, it's a destination and experience. An attire example, cover it up and class it up. The weather was incredibly windy and rainy during our visit or I would have done more glamourous things to my hair. An important thing to know about the Velvet Tango Room is that these cocktails are handcrafted. All are $18 (including tax) unless otherwise noted in the menu. You're paying for the finest and freshest ingredients. If you'd prefer something straight-up the prices are in the back of the menu and many go way over $18. If spending $18 on a cocktail makes you nervous, this place is not for you. I don't spend every weekend throwing down nearly $20 on a drink, I think a special occasion calls for an experience and the $18 is well worth it. The Velvet Tango Room does not have an extensive list of food options, the list only takes up a small page on the back of the menu. The rest of the menu is brimming with libations. If you think you'll be hungry plan on eating before or after, if you'd like a snack while enjoying your cocktails the 'artisanal cheese plate' was wonderful. We particularly liked the spiced almonds which were included. We also had the 'warm olives and almonds' which were seasoned with sun-dried tomatoes, orange zest, chili and thyme. Choosing a plate of food to order will be the least difficult decision that you'll make at the Velvet Tango Room. The cocktail list is extensive, the bartenders will take time to help you with your selection if you wish, you probably can't go wrong with your order if you choose to go our on your own. My first cocktail was the India Lime Fizz which has been featured on Food Network's Best Thing I Ever Ate. The India Lime Fizz "brings the exotic taste of floral India limes and notes of vanilla to the rich and creamy base. The use of a whole egg disguises a particularly powerful cocktail." The India Lime Fizz is sweet and acidic, but mellow at the same time. The ingredients intertwine and complement each other nicely. The egg gives this a nice full-bodied mouth-feel almost like the silkiness of a meringue. Dave selected a classic, which was of course elevated by the Velvet Tango Room. The Velvet Tango Sidecar is described as follows "Two parts Cognac, one part Cointreau, one part lemon. These are the perfect proportions of this classic cocktail." Dave said he selected this because he wanted to feel like Hemingway, the menu also described the history of the Sidecar, "Created in France in the 1920s, the Sidecar became a signature drink for the Hemingway ex-pat crowd in postwar Paris." He felt fancy connecting with history, and the drink was delicious, robust and just sweet enough. My second order was an Amaretto Sour. Disregard everything you think about amaretto sours and forget about the fluorescent sour mix that the grocery store sells, this is the real deal. Described by the Velvet Tango Room as "an egg white, fresh squeezed lemon and lime juice, simple syrup, and the spirit of your choice." According to them, "the egg white is key - it acts to bind the juice, sugar and alcohol into a showcase for the primary liquor." The Amaretto Sour was perfection in a glass, I really enjoyed the India Lime Fizz, but I think that this drink might have been even better. The maraschino cherries are imported from Italy, the complex flavor of this maraschino is a far cry from the bright red spheres that you'll find in typical bars. There was a perfect mix of sweet, sour, and tart in this Amaretto Sour. Dave chose a KatyDid as his second drink, described as "A heavy dose of Solerno - a blood orange liqueur, Belvedere vodka, fresh lime juice, and a dash of orange bitters." This drink was developed by their bartender Katy and is finished with a flamed orange peel. This second drink was more assertive, and more sour, than the Sidecar, but Dave enjoyed it just as much. Other drinks which were ordered by our group included an Apricot Brandy Sour (our bartender's favorite drink), Mai Tai, and a new cocktail which is not yet on the online menu. One downside that I found with the Velvet Tango Room -- we had some miscommunication making a reservation. I submitted my reservation via their online form. I didn't hear back for several days so I decided to call. The bartender told me that they cannot take reservations over the phone and provided me with the contact information of their reservation coordinator. She gave me an email and I proposed two dates and two times for each, knowing that they're busy. Then I never heard back. Another friend called a few days later to find that my name was on the list for the first date I suggested -- whether or not it ended up there by virtue of the online reservation form or my conversation with the reservation coordinator I will never know. You should receive a response regarding your reservation within a day or so of sending the form through Velvet Tango Room's website, if you don't receive one follow-up. I don't want to spoil the excitement of the backroom for you, but I will say that it is worth making a reservation, it's more exclusive and once you have a reservation your spot is guaranteed, as opposed to waiting for a table upfront. One important note about reservations in the backroom is that there is a two drink per person minimum. If you have a designated driver, no problem, you just need to order and consume two drinks for every person in your party, it doesn't matter who is drinking them. There is a bartender in the backroom and the pianist rotates between locations, so you won't be missing out on anything. Sitting in the backroom helped add to the ambiance of the experience, especially since the bartender was able to take time to help us select which cocktails to order based on what flavor profiles we like. If you're looking for a unique night out in Cleveland I cannot say enough about the Velvet Tango Room. 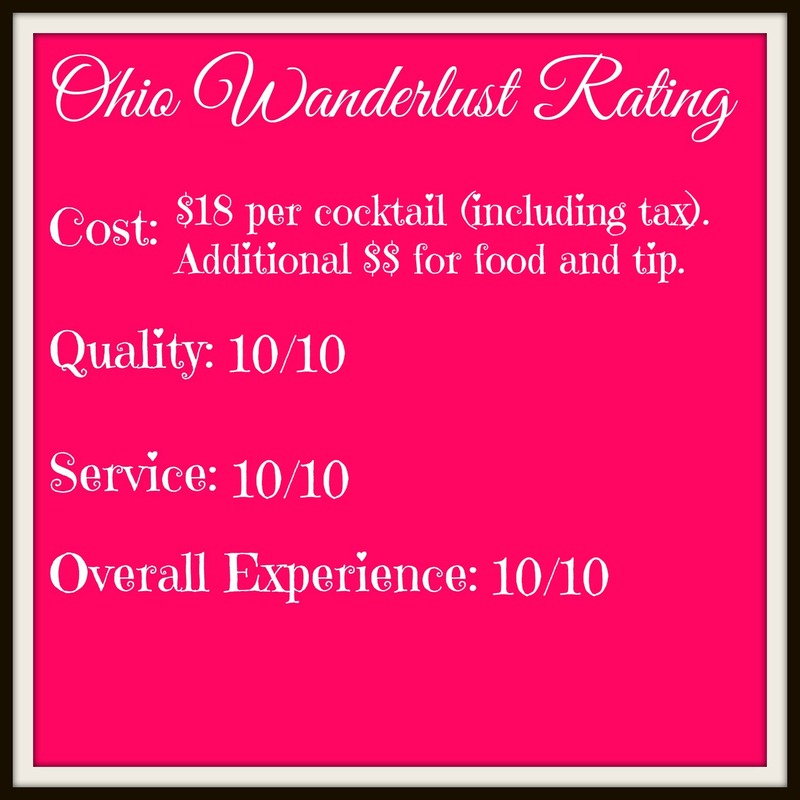 Plan your next anniversary date, girls night out, or celebration around this experience and I don't think you'll be disappointed.